12 recipients have been awarded a 2014 IAPD Scholarship through the IAPD Charitable Foundation. The International Association of Plastics Distribution (IAPD) is pleased to announce that 12 recipients have been awarded a 2014 IAPD Scholarship through the IAPD Charitable Foundation. Annual IAPD scholarships are awarded based on a student’s academic achievement, extracurricular activities and financial need. Andrew Baker, son of Jeffrey Baker, an employee of Asahi/America, Inc.
Chris Hall, son of Helene Hall, an employee of Cope Plastics, Inc.
Penelope Hussey, daughter of Cheri Hussey, an employee of Port Plastics, Inc.
Vanessa Lopez-Moratalla, daughter of Paul Aucremann, an employee of Port Plastics, Inc.
Elizabeth Wiley, daughter of Robert Wiley, Jr., an employee of Cope Plastics, Inc. This is the second recognition for Kimberly Baston, Brad Burnett and Nicholas Gross, who were awarded last year with a 2013 IAPD scholarship. IAPD member company employees, children of member company employees and students enrolled in an undergraduate or graduate degree program for polymer sciences are eligible to apply for the IAPD scholarship. IAPD scholarships are funded by donations from IAPD member companies and individuals in the plastics industry, as well as IAPD and its for-profit subsidiary, Association Services International. Each year, scholarships are awarded in amounts up to $4,500. The IAPD Charitable Foundation was established to develop and administer the annual scholarship program at the undergraduate and graduate levels and to promote the study of polymer sciences. This program benefits both deserving students and academic institutions while also helping to channel outstanding personnel into employment within the plastics industry. Provide meaningful financial support for the education of worthy scholarship candidates. Benefit the business community through well-educated employees. Expose scholarship candidates to the ever-expanding plastics industry. Strengthen IAPD through a direct link to education today. To find out how you can support the IAPD Scholarship Program, please contact the IAPD Foundation at +913.345.1005. The International Association of Plastics Distribution (IAPD), established in 1956, brings together distributors, manufacturers, manufacturers’ representatives, fabricators, recyclers and service providers in an environment which encourages a free flow of ideas and information that help members build their businesses. Every program and service we provide is designed with the simple goal of helping our members increase profitability. Membership in IAPD is an affordable business investment. IAPD provides training, connections with customers and suppliers and information about developments that impact the industry. What makes IAPD unique is a commitment to educating customers and other key end-users about plastics. In other words, IAPD works with members to build the demand for plastics. Central to this effort is the reinforcement of the value of distribution. For more information, visit http://www.iapd.org. 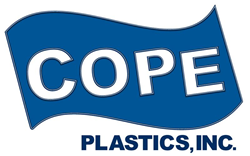 Cope Plastics is the premier distributor and fabricator of plastic sheet, rod and tube across the Midwest delivering solutions to our valued customers since 1946. The company is proud to be a certified Women Owned Business by the NWBOC since 2012. Visit us at http://www.copeplastics.com.